Had a blast interviewing Rich Stevenson the other afternoon. I particularly enjoyed his openness and honesty, Rich started as a bedroom coder and he hit lucky with Short’s Fuse for Firebird Software (thanks to his dad, long story, it’s in the film), and from that point Rich accelerated as a developer working on many Spectrum titles… notable Spec games include Pub Games which hit No 1 in the bestseller charts, BMX Ninja, Cricket Captain, Matalyx, Dynamix, Double Dare, Dead or Alive, Popeye 2, Wrestle Crazy (Popeye 3) and Bangers & Mash. In the film Rich gives us some exclusive stories and insights into the Spectrum games industry of the day. Thank you Mr Stevenson! 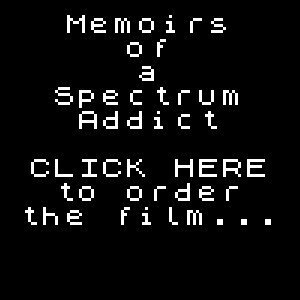 It is with great pleasure I’d like to announce FIVE new amazing interview additions to the Memoirs of a Spectrum Addict movie. Rick Dickinson. Rick is only the flippin’ engineer who designed the ZX80, ZX81 and – of course – the ZX Spectrum. You want to know why the Speccy was black, not white? Why the space key was not a bar? Why the keys were rubber and the top case aluminium? All will be revealed! Stephen Crow, seminal author of Wizard’s Lair, Starquake and Firelord – Stephen has kindly agreed to be interviewed for the film! Bo Jangeborg. Many will know Bo as the author of The Artist and The Artist II, an amazing utility that allowed so many people to create their own graphical masterpieces. Others will know Bo as the author of Fairlight and Fairlight II, published by The Edge, awesome 3D isometric adventure puzzle games which wowed fans and press alike. Bo has kindly agreed to be interviewed for Spectrum Addict. Rich Stevenson. Rich came to prominence with the Firebird title Short’s Fuse, and then went on to become one of the Spectrum’s most prolific developers! Highlights include Dotty, Popeye 2, Bangers & Mash, Pub Games, Dead or Alive, BMX Ninja and Wrestle Crazy. Do you remember laughing so hard you puked? That would be Fergus McNeill, humorist and adventure programmer who penned not only Bored of the Rings, The Boggit, Robin of Sherlock and The Big Sleaze, but was entrusted with the Terry Pratchett Discworld license The Colour of Magic and made a damn good job of it. Hail Sir McNeill!! etc etc. Follow Spec Addict via Email. Enter your email address to follow Spec Addict and receive notifications of new posts by email. Spectrum Addict: LOAD “FILM 2” announced. The Editor on Andrew Hewson Interview. pinkapplejam on Andrew Hewson Interview.